You are currently browsing the tag archive for the ‘crafty!’ tag. Welcome back to the 100 Delightful Things in Worcester Project, 2017 #RHPFF edition \o/ This year the lovely Rabbit Heart Poetry Film Festival interns, Sarah Meigs & Alli Jutras* are taking the reins & bringing us the good stuff. This week they got to check out the Worcester Center for Crafts. If you’re unfamiliar with Worcester, you’d probably have no idea what magical kingdom exists at 25 Sagamore Road. Worcester Center for Crafts is housed in a lengthy brick building near WPI and is a community that welcomes all artists (both experienced and inexperienced) to practice their craft. The organization welcomes anyone to join their community to learn art skills, refresh their arts background, and unite with a wonderful association of creators. Sarah and I were thrilled to visit Worcester Center for Crafts, and had a wonderful time meeting Honee Hess – the Executive Director with an inspiring spirit. Honee gave us a tour around the facility and offered us background information about the organization. Worcester Center for Crafts has grown immensely over the past century and a half through its ups and downs. It was first established in 1856 in order to provide learning opportunities in the field of crafts, resulting in more job opportunities to sell and create crafts. Since its origin, Worcester Center for Crafts has relayed the importance of crafts in everyday life – whether it be for personal or professional reasons. Our tour started off in the Gallery Store, where a multitude of jewelry, paintings, dishware, and other crafts were on display and available for purchase. Sarah and I both admitted that we were tempted to buy basically everything in the store. Most of the crafts for sale had been made in Worcester Center for Craft’s studios. The Gallery Store is open Tuesday-Saturday from 10 am to 5 pm. Next, we checked out the Krikorian Gallery, which features beautiful photographs and paintings by local artists. When we visited the gallery was exhibiting art by female artists, which was inspiring and moving to both hear about and see. I would have spent hours admiring the creations in the gallery if I could, but 10 minutes was enough to realize how amazing the works of art are. The Sagamore Street campus includes Worcester State studios, where Worcester State students take their studio art classes – a successful integration of two important elements in the community. We were also excited to see the ceramics studio, a spacious spot with tons of natural light where numerous artists were hard at work. The Glass Studio is located across town, so unfortunately we weren’t able to check out the location on the same day. However, if you’re interested in visiting, the Glass Studio is located at 35B New Street in Worcester. Whether you’re looking to take classes, visit the Gallery Store, see the work exhibited in the Krikorian Gallery, or pay a visit to a staff of inspirational and moving people, the Worcester Center for Crafts is a great spot. You won’t be disappointed. The administrative hours are Monday to Friday, 9 am to 5 pm. Stay crafty! *#TeamSalli FTW! Thank you Clark LEEP Program! So… Looking at this project from the front and kind of far away, without anything in hand and just the paper dollies stop-motion trailer from last year under my belt, it looked like simply A Good Time. A little closer up, sitting on the orange rug in the office, surrounded by ripped open bags of secondhand Barbi, Bratz, and a variety of other unidentified dolls* from the thrift store, it still looked like fun, albeit somewhat complicated fun – there was a problem to solve, and I generally like a problem to solve, especially when it involves clay, dictionary pages, ink, and glue. And over the course of a few weeks, with the generous application of all of those (delicious) supplies** our models emerged at last, rabbit-headed and incredibly tippy,*** but creepily darling in their own right. And then I had no idea what to do about it. Because that’s kind of how I work, right? I write novels without outlines,† I push things into motion sometimes (ok, often) with only a general plan, and I have been known to go on a spending spree at the craft store just because I want to touch all the things to find out how they feel. A friend once asked me what I thought my defining drive/emotion was, and for me it came down to Curiosity. This is to say, my inner critic is strong, but she also often gets squashed down by my inner six-year-old, who just wants to know How Things Work. Ok, so I had a clue: I knew that Picasa would crunch pictures for me once they were amassed. I knew that we would need something stable to hold the camera while we took a brazillionty†† pictures for Picasa to crunch. I knew that lighting was going to be A Thing. And I knew that keeping track of two figurines, specifically, which leg of which figurine was going in which direction during micro-movements, was going to be a little tricky.††† I also knew that we were going to need to build a set that not only looked nice, but accommodated some really top-heavy movie stars.‡ And so, armed with an idea, we dug in to make a trailer. – We opted for the iPad to take the pictures, because it does a better job than my phone. Also, I do not own any high-end camera equipment. – We set up lamps. We broke a lamp. We agreed we needed more lighting. We bought two cheap clip lamps (cheap clip lamps are The Best! Just, you know, make sure you have something to clip them to.) and a pack of 100-watt bulbs from HoDo. We moved in a couple power strips. We adjusted and adjusted and adjusted, and sighed and decided to humor one particular set of shadows in favor of dulling a big shiny reflection on the pretty green wall. In retrospect, we probably could have benefited from a string of LED Christmas tree lights taped strategically behind the set. – We stuck the iPad on a couple books and boxes (and a tiny side table), and strapped that mess together with masking tape. PRO TIP: I picked up a pack of foam popsicle stick looking things, initially to place between books to keep them from sliding. They were sort of ok for that, but not as good as the rubberbands. What they were REALLY good for, tho’, was as shims – we used them to keep pretty much everything level. And by everything, I mean the camera setup – we slid some under the iPad case, we slid some under the tiny side table, we popped a couple in under a book when the shot looked a little off. – We applied generous amounts of modeling clay to the feet of our dollies to provide some support. This really worked out really badly. We revised our approach. PRO TIP: if you want to get something to stay in place, the intuitive leap to modeling clay is great only in theory. Pick up some sticky-tac. You know, the stuff you use to hang up posters without cocking up the semi-gloss on your walls? It is AMAZING in these situations. Truly, I cannot praise the stuff enough for on-set shenanigans – with the sticky-tac we were able to make our models go where we wanted without having to employ balancing tricks; we just sort of, well, stuck stuff to other stuff where we wanted them to be and shot quickly. Hello, I ♥ sticky-tac. – Team Salli posed the models, ducked out of the frame, and I shot. Pose, duck, shoot, pose, duck, shoot, pose, duck, shoot. Sometimes I posed and ducked and one of them shot. We did that for roughly 250 pictures – Good Times. *Some of which were unidentifiable because they were missing a head, or were only a head. The thrift store sells them in plastic bags that seem to have been scooped roughly out of a bin marked Random Doll Parts. Or maybe a dumpster behind a daycare. Anyway, the contents are all mismatched and really ought to be washed down before too much handling. I, natch, spilled them out on the rug and decided to wash my hands really well afterward. Before I vacuumed. **And paperclips (to hold on the ears). And a multitool (gogo Leatherman!) There’s most of a Skipper doll inside the little bun – some bits needed to be trimmed. Honestly, the most difficult part of the transformation was getting the hair off the dollies so that the air-dry Crayola clay would stick to the doll. And on that note, I must once again mention (I know you’ve heard me say this before): Behold the humble glue stick. Your materials almost never need to be expensive, they just need to do the job. Stuff we used for this project included wood glue, an $8 glue gun, Elmer’s glue sticks, used toys, a sheet of sticky tack, roughly-used dictionaries, a couple of $6 clip lamps (the bulbs were pricier than the lamps! ), and kids’ craft air-dry clay. Stay simple, y’all. ***Some of this is down to the user. I was never a kid who played with dollies. Our interns, Alli & Sarah (whom I have been known to refer to fondly as Team Salli) were able to get them both to stand up with far less stress than I. †Admittedly, the last one took me 10 years to complete. I’m not proud of that, I just can’t seem to stick to an outline. In my own defense, I did write four short stories and a chapbook worth of poems that applied to the same universe in that time. ††FWIW, there are easily a Brazillion Portugese speakers on the Ragnaros realm in World of Warcraft. And I have pugged with a fair number of them. †††This is where having two interns was particularly great – one dolly per intern really helped! ‡Sidenote: there’s a serious riot grrrl rant in here somewhere about how dolls marketed to boys, action figures, stand up better than dolls marketed to girls. But since I did happen to add a shitton of weight & counter-intuitive-balanced ears to the figures (not to mention, encased Skipper in an super unnatural position inside that small bunny), this is probably neither the time nor place. Ok. So I can’t seem to get more than a third of my to-do list tackled on any given day,* but I can totally manage to start new projects. I’ve been aching to try out arm knitting for what feels like forever – A woman I worked with shared a video of it with me and I became intrigued like whoa. I even pinned*** it, intending to try it out when I got a chance. Ok, really, intending to try it out when I found the right yarn (chunky) at the right price (cheap – I’ve never tried this, so no need to spend a lot of money on it). I haven’t found said yarn yet. 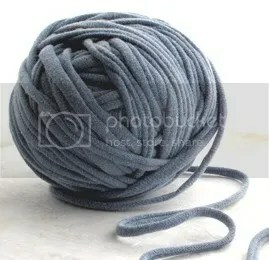 Also, I’ve heard tell of making yarn from tee shirts, and have been just dying to try that out. Then I mentioned to a friend the tee-shirt yarn thing, and she mailed me a pin about how to do it, and omg, SHOWED UP AT OUR HOUSE WITH A BAG OF TEES! Squeee! Thank you, Sarah!